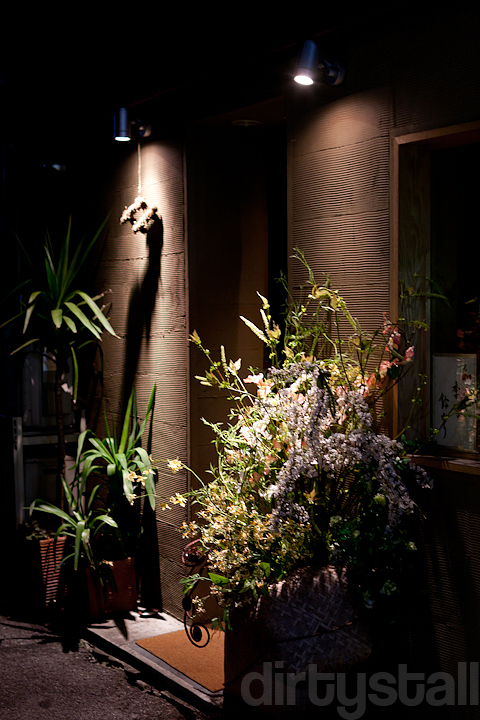 Suzunari is a cosy little restaurant located deep in the heart of Yotsuya San-chrome, buried down in those narrow alleyways. It’s actually a bit hard to find if they didn’t have a whole bunch of flowers outside. 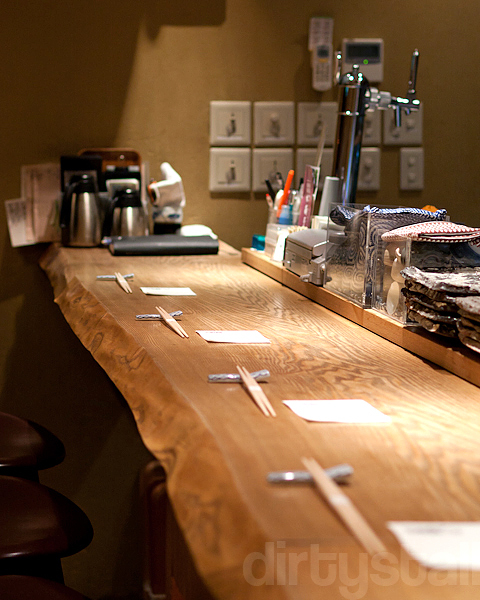 It has about 3 tables and a 7 seat counter, made out of a solid plank of wood. And his lovely assistant at the other end. 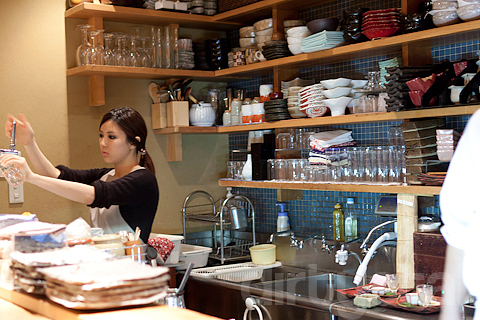 You can see how small the whole kitchen really is but yet he can produce so many nice dishes! Napkin with their name on it. 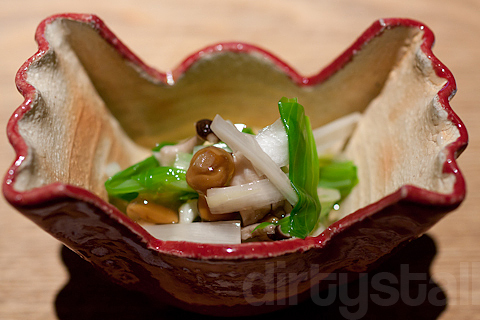 An appetizer of assorted vegetables and nameko mushrooms to begin with. The more elaborate appetizer, or hassun, is next. 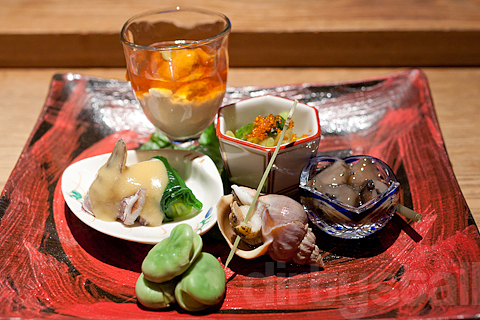 In the glass cup is yuba and uni; the hexagonal cup contains wasabi stems which have the bite of wasabi paste but not so intense; namako with yuzu-flavoured sauce to give taste to the bland sea cucumber; tsubugai or whelk; soramame beans; shakko with miso sauce, this is a mantis shrimp. This is probably my favourite dish of the whole dinner, an uni chawanmushi with crabmeat. Words can’t really describe how delicious this was but if you’ve eaten all those ingredients before, you’ll have a good idea. 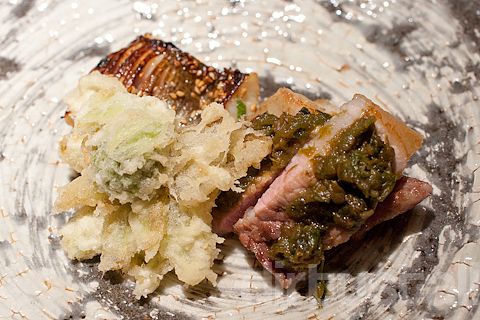 A grilled dish of kamasu, buta miso and fukinotou tempura. Kamasu is barracuda and the meat is surprisingly tender and fatty for a fish with a fierce association, almost like cod fish. Fukinotou tempura is the butterbur sprout and it was the worst thing there, very very bitter. And judging from the chef’s face, he was expecting that reaction from me because he broke into laughter when I frowned at him. Kamo rosu with takenoko. This is a Japanese style of cooking duck breast where they pan-sear it quickly on both sides then poach it briefly in a stock and leave it in there to marinate and absorb the flavours of the marinade. The duck breast with very tender, with a texture more like a pork chop tenderloin. 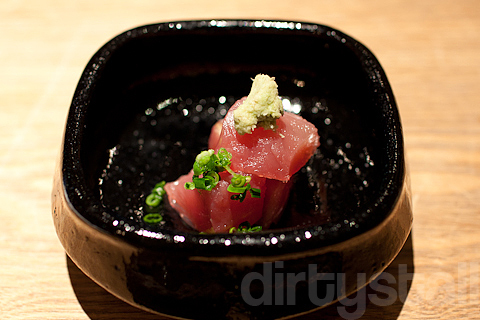 It also had all the savoury flavour of the marinade imbued into the meat. 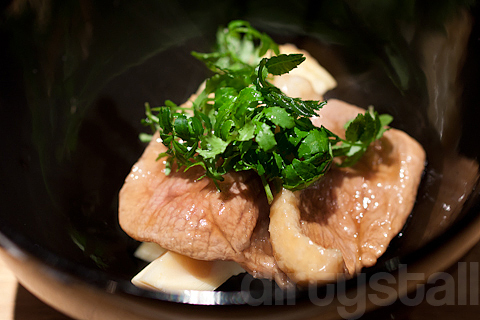 The young bamboo shoots provided a textural contrast to the duck breast. Rice with taro and tarako. 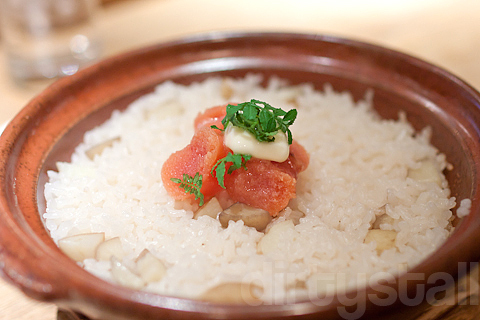 This is a simply boiled rice with somewhat tasteless taro pieces and salty cured cod roe in it. The rice despite looking so plain was actually quite delicious in a subtle way. 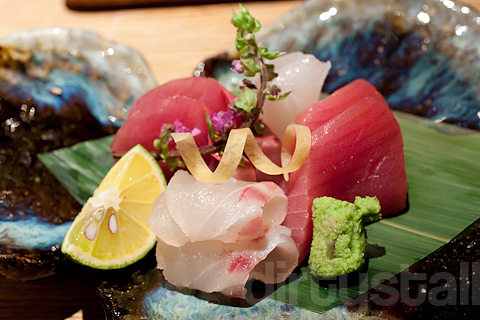 This was served with a side of asari clam miso soup. 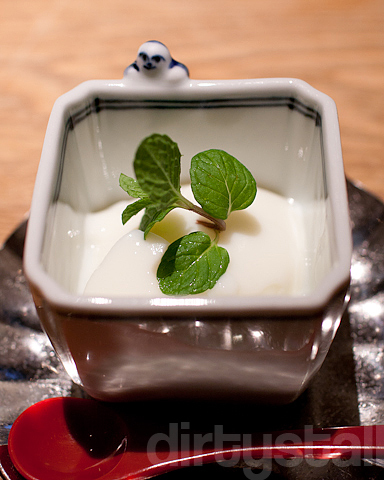 Dessert was almond jelly, which I didn’t like because I don’t like almonds. The sprig of mint did help to moderate the almond taste though. 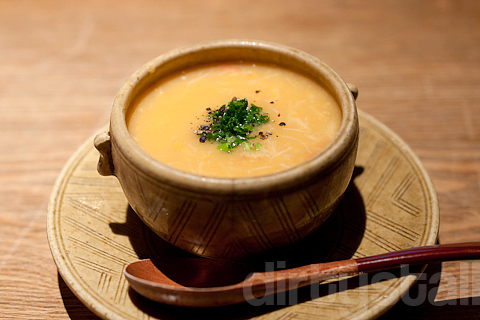 This reminds me of Goto’s lunch! Looks so delicious. 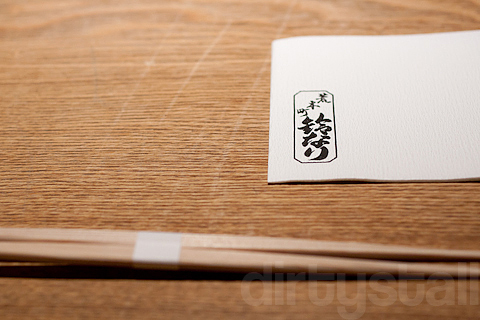 Haha yeah, except the food is slightly less refined since it’s not a true kaiseki. But it’s still damn delicious! I love tarako ! 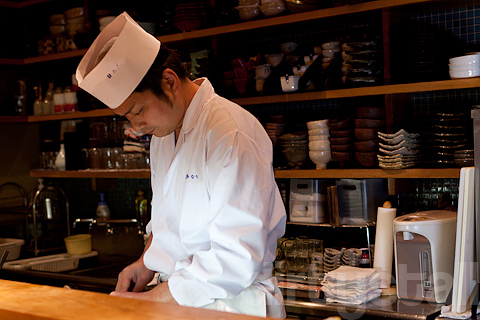 Maybe Fukinotou is an acquired taste that the locals like, and the Chef expected you to not like it ? Yeah I’m pretty sure since that bud was bitter as hell!